An inexperienced South African combination finally breaks Pakistan’s streak of winning T20 series. David Miller gave a renowned exhibition of his power hitting game and Babar Azam responded with a batting master class as the Proteas and Pakistan produced another white ball special at the Wanderers that will long be remembered. 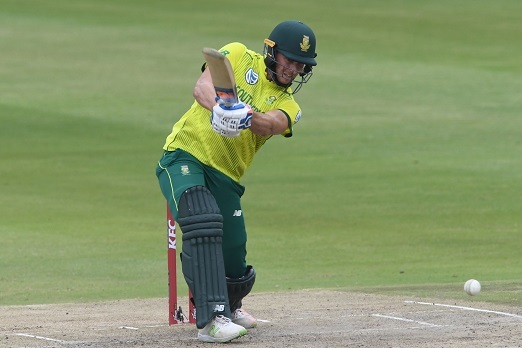 In the end the Proteas won the second T20 international by seven runs to clinch the three-match series 2-0 with the final game to be played at SuperSport Park on Wednesday. Miller smashed an unbeaten 65 off 29 balls with four fours and five sixes to set Pakistan a highly competitive target of 189. In the process he scored South Africa’s fastest T20 International half-century against these opponents. Babar then proved himself equal to the challenge as he responded with 90 off 58 balls with 13 fours and one six. Apart from the fact that he was batting with a protective helmet he looked every bit the part of a modern day Sir Viv Richards as he played risk-free cricket for most of his innings. The Proteas had an unsung star and a new hero in 20-year-old debutant Lutho Sipamla who pulled the attack together after the initial Pakistan onslaught, bowling four one-over spells. In the end he conceded just 23 runs which was a match-winning effort in a high-scoring encounter. He showed excellent control and a very cool head as he mixed up his pace and varieties and enabled his fielders to block the Pakistan scoring strokes – something that is not always easy at the Wanderers.